KUALA LUMPUR: Eastern & Oriental Bhd (E&O) has put five other non-core assets up for sale, following the successful disposal of its Lone Pine Hotel in Penang and soon a piece of land in the Kuala Lumpur city centre. He said there has been potential buyers expressing interests in the group’s non-core assets, but declined to disclose names and estimated gains prematurely. Kok was speaking to reporters after the group’s annual general meeting here yesterday, alongside E&O senior general manager of corporate investment and planning Yeonzon Yeow. So far, the group has sold its Lone Pine Hotel, and is now in the midst of selling a piece of land in Jalan Liew Weng Chee, off Jalan Yap Kwan Seng, Kok said. Once the divestment is concluded, gains from non-core asset disposals for the group thus far would be boosted to RM140 million, he added. Apart from selling these assets and the group’s existing inventory, Kok said moving forward, E&O will be relying on its RM841 million worth of unbilled sales to be recognised over two financial years, and revenue contribution from its deal with Kumpulan Wang Persaraan (Diperbadankan) (KWAP). For its ongoing Seri Tanjung Pinang phase 2A (STP2A) reclamation project, jointly developed with KWAP, Yeow said E&O has applied for the necessary titles and is expecting the first batch of titles to be issued by year end, with the remaining to be issued by mid-2018. Henceforth, Kok expects the group to achieve full-year results in the financial year 2018 (FY18) that are comparable to its performance last year. For the financial year ended March 31, 2017 (FY17), E&O’s revenue jumped nearly 67% from RM442.18 million to RM704.76 million. Its net profit more than doubled to RM87.58 million from RM37.19 million previously. Kok also clarified yesterday the damages to its century-old E&O Hotel in George Town due to flash floods in Penang are inconsequential, and that it is business as usual after the floods subsided. 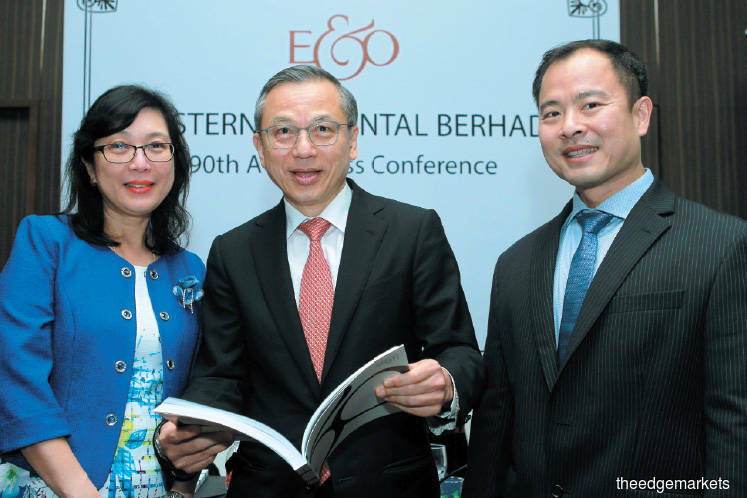 E&O’s share price has been declining since its peak at RM2.12. The stock retreated to RM1.59 yesterday, with a market capitalisation of RM2.11 billion.